by WATT, JAMES C. Y. 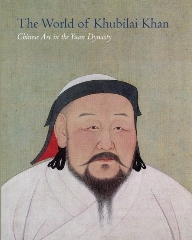 Description In 1215, the year Khubilai Khan (1215��1294) was born, the Mongols made their first major incursion into North China and initiated a period of extraordinary creativity in the arts that was encouraged by the confluence of many cultures and ethnic groups. This period lasted approximately 150 years and had its greatest flowering in the Yuan dynasty, founded by Khubilai in 1271 and lasting until 1368.